Spirulina and Chlorella are two of the world’s most perfect foods – tiny, ancient and unbelievably powerful. These two foods can supercharge your health; providing incredible levels of nutrients while helping prevent a number of common ailments. Spirulina and chlorella are one-celled micro-algae, 2-10 microns in size – about the size of a human blood cell. They are ancient in origin. Spirulina as a food source dates back to the 9th Century Chad. In addition, there is evidence the Aztecs in the 16th Century were using it. Spirulina has only been in mass-production since the 1970s. Chlorella came into mass-production slightly earlier, in the 1950s. Spirulina and Chlorella have both been touted as perfect foods that could feed the world. For various reasons neither have really taken off. They are both complete proteins that contain approximately 60% protein by weight – that is about 3 times as much as ground meat. A complete protein is one that contains all the essential amino acids in proper proportion. And that is not even the complete list. Spirulina is very effective at increasing your metabolism when you exercise and reducing fatigue afterward. If taken before a workout it can increase your stamina by giving you high quality, easily digested and absorbed protein and a wide array of useful vitamins to keep you going longer and recover faster. What’s special about chlorella is that it has the highest known amount of chlorophyll by weight of anything on the planet. This makes it the strongest cleansing food anywhere. This means you can be slowly and gently detoxifying your body with ongoing use. Spirulina and Chlorella will significantly boost your health and well-being if included in a daily regimen. 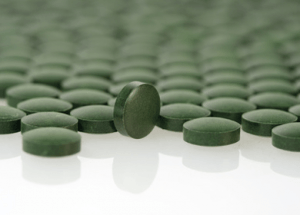 Recommended doses are: 5-10g daily of spirulina; 3-5g daily of chlorella. This dose is considered a baseline level – you could take more to get bigger benefits. You will see more benefits the more you take. Take note that spirulina and chlorella are relatively high in iron, which means that people who need to control their iron intake should be cautioned, for example people with hemachromatosis. People who have problems with severe seafood or iodine allergies are also cautioned. Make sure to buy Chlorella Pyrenoidosa with cracked cell-wall. This will ensure maximal absorption and quality. In addition, spirulina and chlorella are quite expensive when purchased at health food stores, and the prices tend to be exorbitant. This is likely because they are being sold as a health food supplement rather than as food. You can find these products from online retailers for a fraction of what they usually cost in stores. Have you tried Spirulina or Chlorella? Let us know in the comments. Previous articleHave You Met These 4 Difficult People? Hey Buddy!, I found this information for you: "Spirulina and Chlorella: Nature’s Perfect Food". Here is the website link: https://www.thealternativedaily.com/spirulina-and-chlorella-natures-perfect-food/. Thank you.